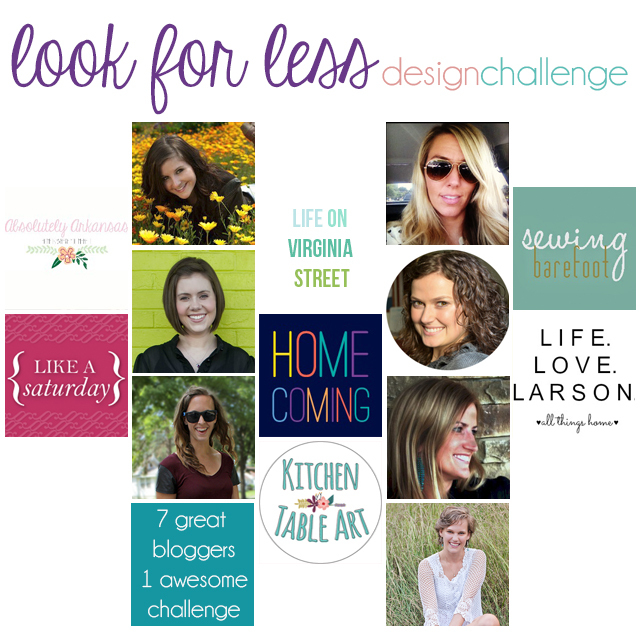 I am once again participating in a "Look for Less" challenge with several other bloggers. 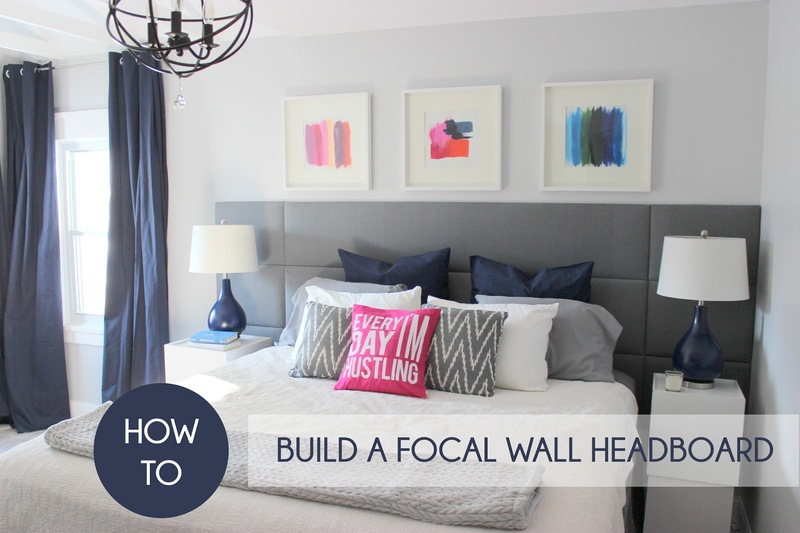 The challenge was to find a designer inspired piece and recreate it for less money. I picked up a small vanity stool at a thrift shop a while back, and this challenge was the just the motivation I needed to get it looking stylish again! 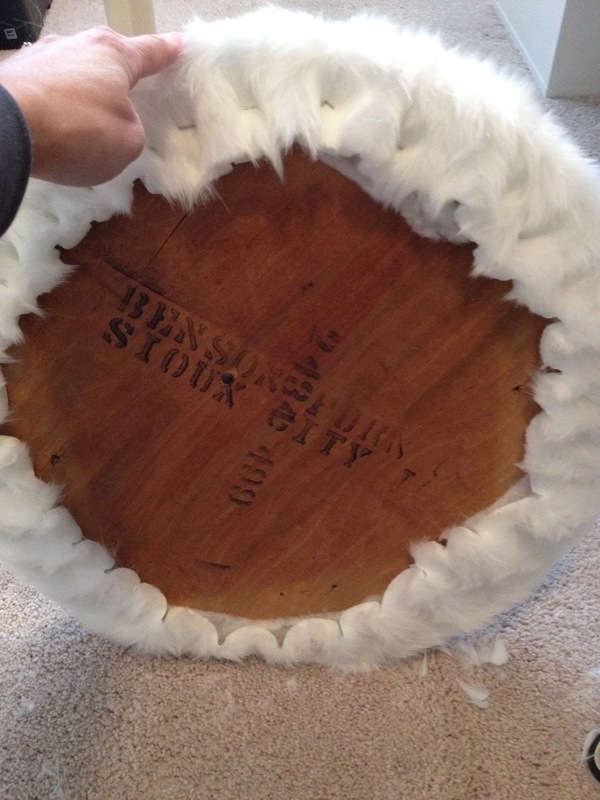 My inspiration piece was this Faux Fur Glam Vanity Stool from Pottery Barn Teen, selling for $179! The stool I picked up at a local thrift store cost me $4.99 and the dimensions were almost exactly the same! My stool does not have the the cross bars in the center, but the shape looked close enough to try to duplicate the look. I purchased some white faux fur fabric at Hancock Fabrics, and with coupons, a yard cost me about $7. I only ended up using about a half a yard. I removed the fabric from the top piece and the batting was in great shape underneath. I used the existing teal fabric as a template to cut the faux fur. 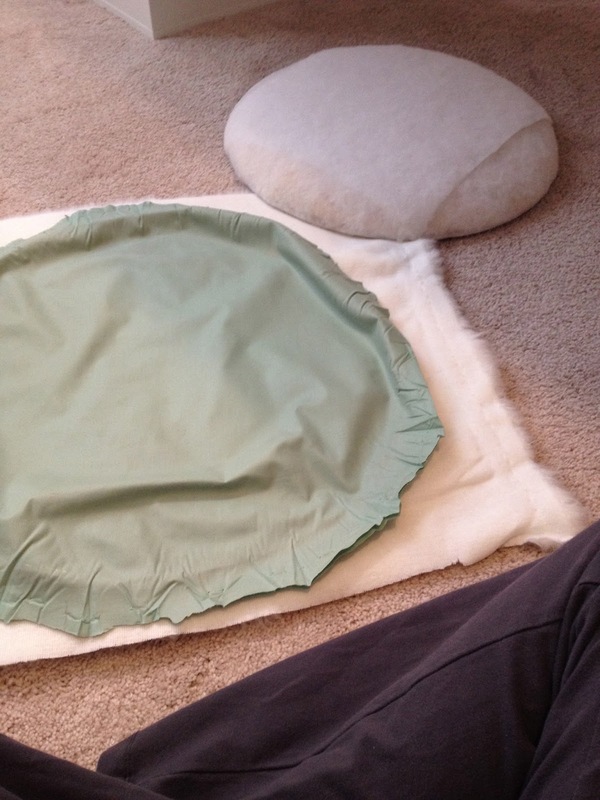 I used a marker on the back side of the fabric to trace the circle and attached the new fabric with a staple gun. As you can see the in photo, I also had to "comb" the fur to remove any stray pieces. Next up, I needed to paint the base of the stool. 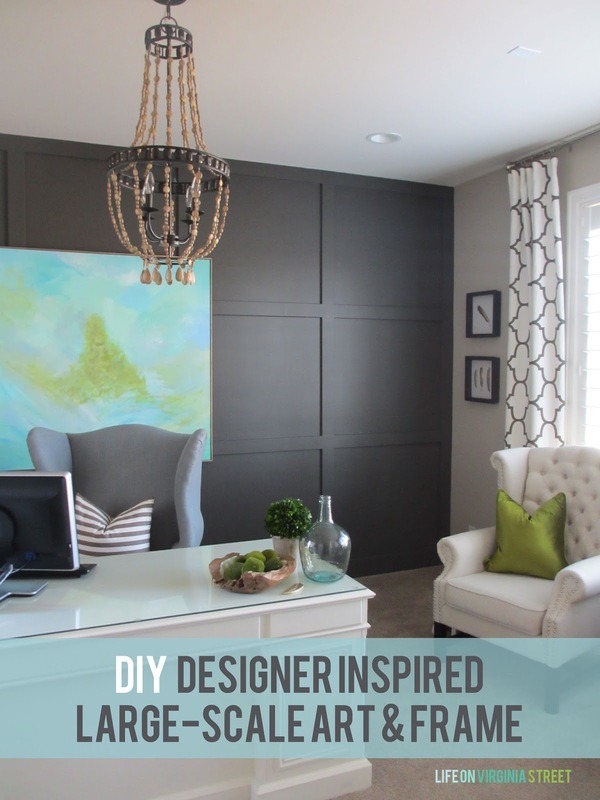 I chose a cool grey tone to keep with the neutral look of the inspiration piece. 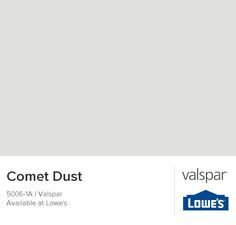 I picked up a sample jar at Lowe's (they carry satin finish samples) in the color Comet Dust. I lightly sanded the base, wiped it down, and painted three coats of the new paint. After attaching the newly upholstered top, the stool looked as good as new! 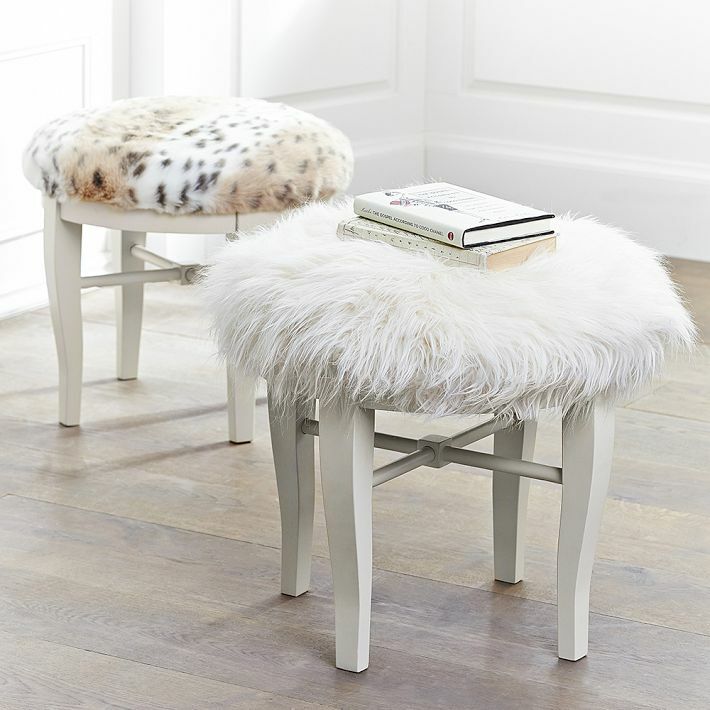 I love the idea of a glam vanity stool, with it's neutral color, and interesting texture. This will find a home next to the bathtub in our master bathroom. Not only is it pretty, but having a seat in our bathroom will be functional too! 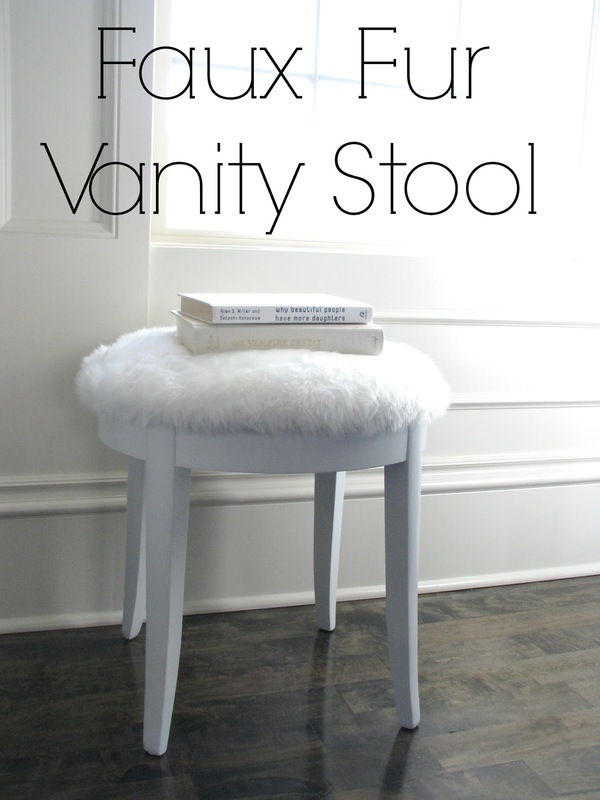 Would I ever spend $179 on a glam vanity stool? I think you know the answer. :) I will, however, take my $12 version! 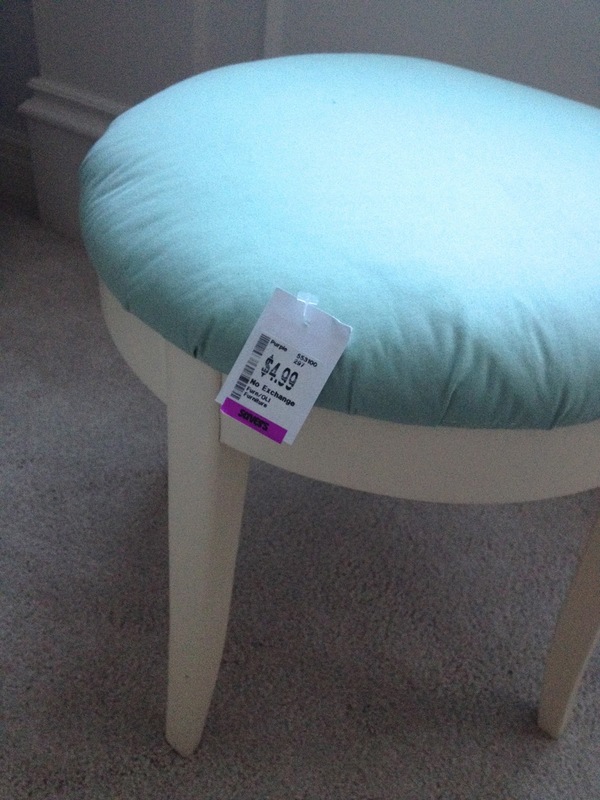 The stool cost me $5, the paint was $3, and I used about $3.50 worth of fabric. 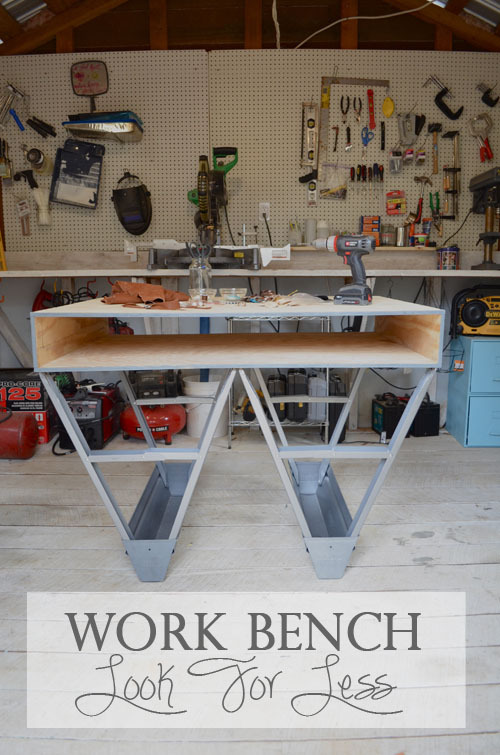 It's not perfect, but it sure beats at $179 price tag! 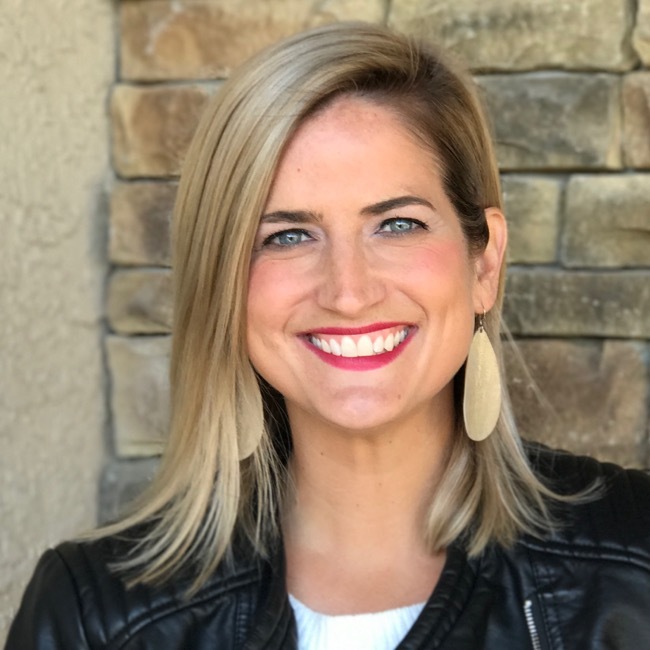 Don't forget to go check out all of the other "Look for Less" posts from these great bloggers! Here are the sneak peaks with direct links! 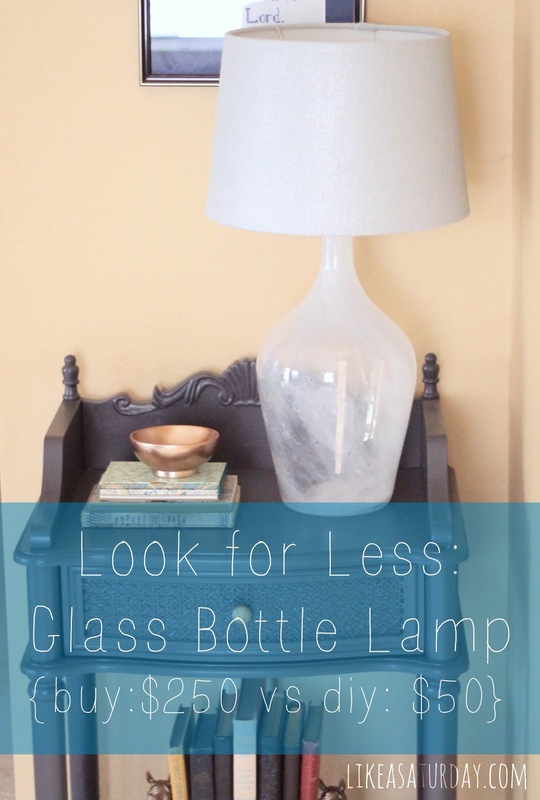 I'm obsessed with how this turned out and can't believe that you DIY'ed it for $12! What?!?! Amazing, and thanks so much for participating in the challenge! How come everyone finds the amazing things at Thrift Stores but me!? You did such a great job making this beautiful, Andrea! In loveeee! 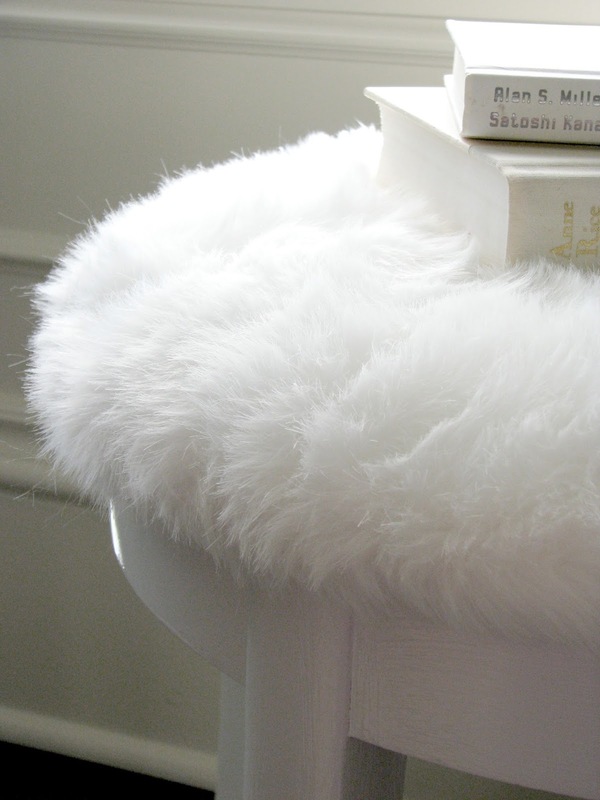 I think the fur adds so much fun texture to your space. 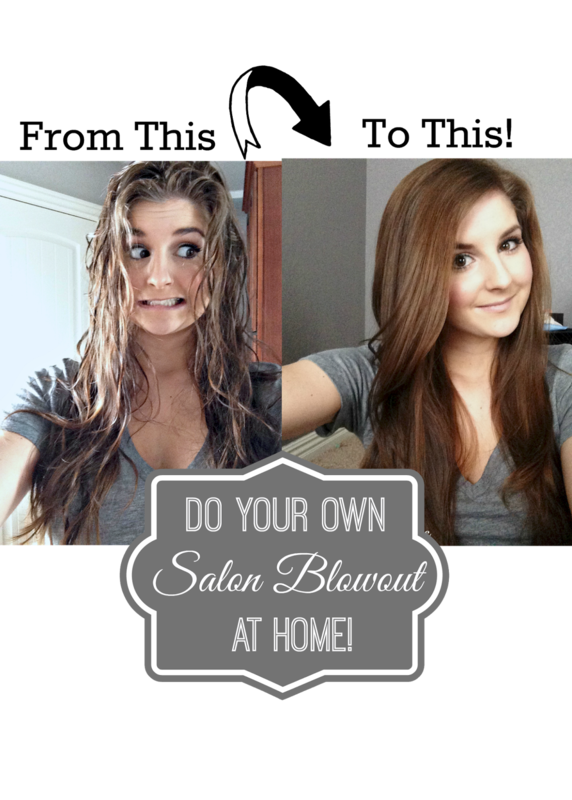 You did an amazing job on this! And how can you beat that price? !